Already a popular game in Novomatic’s land-based ‘Gaminator’ suite of video slots, Sharky is a nice little addition to the pantheon of pirate-related shenanigans available for real money at online casinos. 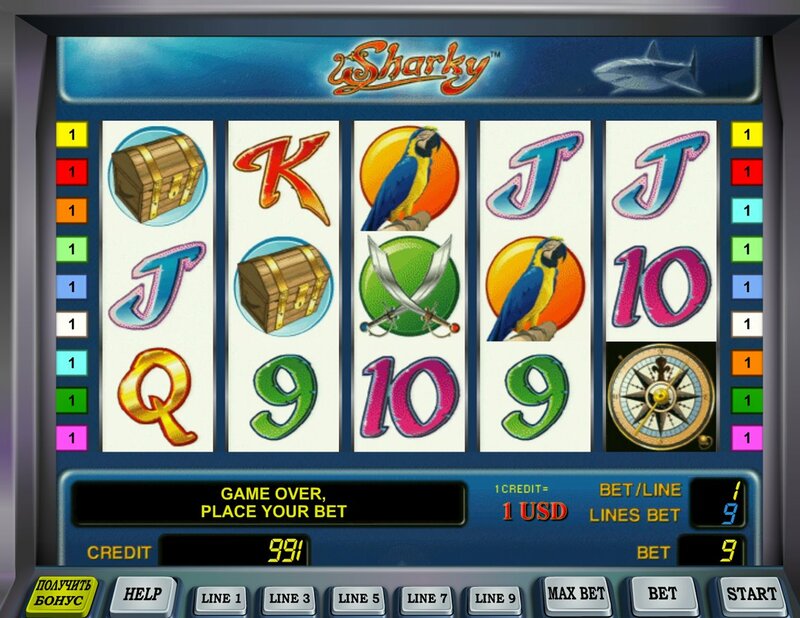 A 5-reel, 9-payline slot, Sharky has a wide range of betting and some simple gameplay. On the reels, to go alongside the regular 10-through-Ace symbols, there are cutlasses, treasure chests, pirate ships and desert islands. 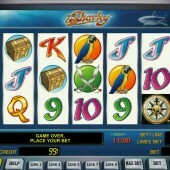 Five Parrot icons pays out a 50,000-coin jackpot, while five Treasure Chests on the reels pays 25,000 coins. Ahoy There! Watch Out for the Wild Pirate! The smiling pirate counts as the game’s Wild, and he substitutes for all regular symbols in the game other than the Compass, Ship, and Treasure Island Scatters. A Ship and Desert Island icon together on the reels triggers a free spins round with 10 free spins up for grabs. This is no ordinary free spins round, however; if you hit another Ship icon during the bonus round, an animated sequence kicks in where our treasure-hunting pirate gets into his boat and lowers into the sea. He will then row from reel to reel, turning symbols wild (Scatters excluded). The Pirate will row across reels during the bonus round awarding prizes, unless he is attacked by the roaming shark icon. Meanwhile, a Treasure Chest icon showing up next to the Pirate awards 18-450 coins. With a nice RTP (almost 96%) and lots of potential wins, this is obviously one of those generous casino-based slots that will be perfect for those who’ve enjoyed certain games in their local casino and want to try them on their PCs at home. Pirate-themed games are ten-a-penny (or should that be ‘pieces of eight’?) these days, but luckily a lot of them are very good. If you’ve tried Sharky and want a little more of the same, head to a swashbuckling casino offering Play 'n' Go's adventure slot, Jolly Roger, or instead, check out the lush graphics and style of Betsoft Gaming's 3D Barbary Coast slot.